Now we have some basic concept of both IP Address and Port number, let’s discuss the UDP in a simple approach. When a computer send out a data packet to the destination computer, it will issue a UDP packet that contains both the port number of the sending computer and the destination computer. The UDP packet will then add to the sending data packet so that when the destination computer receive the data packet, it will check the UDP packet and find out the port number. Therefore the destination computer will send the data to the correct application. Let’s continue with the same network used before and see what happens if UDP packet is add to the sending data. Computer A send a request packet (represent by the red dots) to server. The request packet travel through the Internet. The UDP program installed on the server check the destination port of the UDP packet. The UDP program find out that the destination port is 80. Therefore it sends the data to HTTP Server to process the data. The HTTP Server then send the requested data (i.e. web pages) to Computer A. 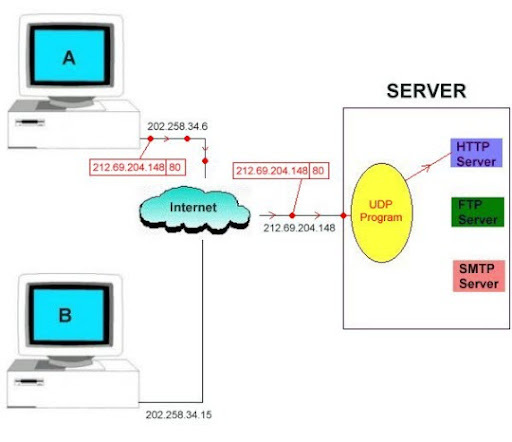 This is how UDP works that allow computer communicate with each others.